Happy New Year Sisters! Are you as excited as I am that registration opened today? 2018 will bring lots of beautiful days for riding, many new motorcycles for all, lots of new riding buddies and our 26th annual Mid-Atlantic Women’s Motorcycle Rally! Last year was an awesome year at MAWMR! So many new faces and new groups added to the magic that is already there with so many women that have been attending for years. We have a favor to ask though – will you be part of our street team? 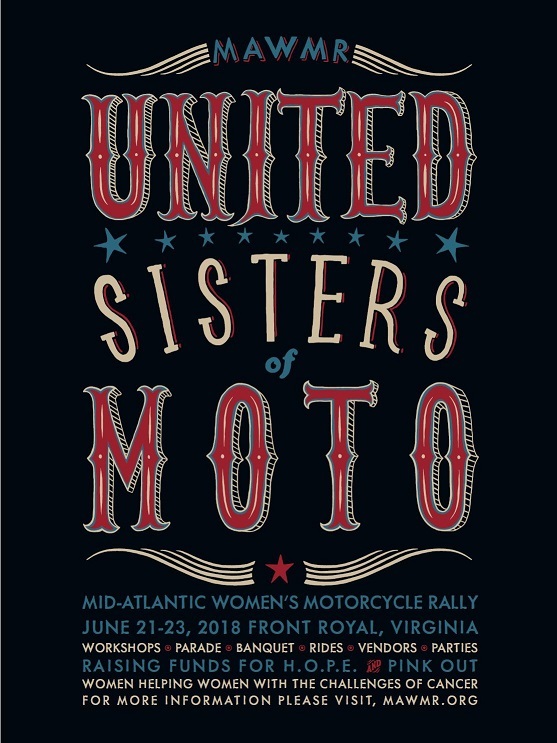 That’s right, we need you to get out and help us spread the word about the LONGEST running all-women motorcycle rally in the United States. That’s right, we need you to email invitations to clubs in your area that you are a part of or know of and also deliver flyers to motorcycle shops, clubs, gear companies, LOH, HOG, WOW, WITW and many more!! You can print out the flyers by clicking the button below, or send and email to info@mawmr.org and we’ll send to you a pack of flyers, stickers and postcards for you to distribute. I am excited to attend this year for the first time. When I printed out the poster it seems too dark to grab attention if posted on a event board. Is there a way to lighten it? At the moment, no but we’ll look into it! I am all over the place, Laurel, Frederick, Annapolis, Columbia. Let me know if you need advertising in those areas. Shoot your mailing address to info@mawmr.org please and we’ll get a packet out to you next week!! !